To my knowledge, there are no known maps (that sounds so cool) of the town directly outside of Gunung Mulu National Park, Sarawak… until NOW! While Google Maps does have a presence in Malaysia, their map is grossly outdated. When I stayed there (August, 2016), I made sure to note every important building, including every hostel, restaurant, and even two churches and a mosque. The town is one long street with a couple of side streets along the way, but I hope this map will help put your mind at ease if you’re one of those people (like me) who prefers NOT to be lost upon landing at an airport. Mulu isn’t connected by land to the rest of Sarawak, Malaysia. 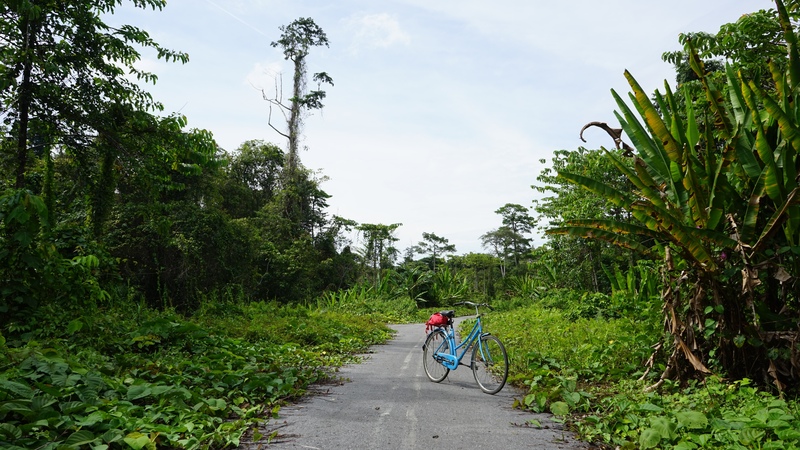 Your two options into (and out of) town are a 3 day hike (Headhunters Trail, can be organized ahead of time) OR a flight from Kota Kinabalu, Miri, or a few other nearby towns. The airport was built less than 20 yrs ago, so the area is still rather new in its development. Do yourself a favor and explore as much as possible. You will find fireflies, touch-me-not plants, deserted roads, eagles, and even unexplored caves outside the park. I stayed at Mulu Village guesthouse (booking info below), and it turned out they are the oldest accommodation and the only one that has bikes for rent. This is a deal maker is you ask me as the sights are breathtaking outside of Mulu National Park as much as inside it. An eagle kept squawking at me every time I rode by. The big tree was its home. Two good resources when planning your trip are Wiki Voyage and Wiki Travel, which I used to find accommodation and make reservations, but for your convenience, I have put important info below. This includes guesthouses that currently do not have an internet presence. Shamrock was started by Tomas Bilong, a fantastic cook and a super nice guy. His guesthouse is conveniently located right at the intersection of the main road and the one that leads to the Mulu National Park entrance. I told him I’d put him on the map and here we are. Oh, by the way, if you’re wondering, he is not Irish. He is a Sarawak local but said he just likes Ireland A LOT, thus the name. Located literally next to the Shamrock. I should note that I talked to some people who were staying at this Lodge and were rather disappointed. They said the private room had gone up in price and was way too expensive for what you get. Just a heads up. Park HQ is within Mulu National Park and run by the government directly. However, it also happens to be the most expensive of the accommodations. A lot of people stay here because they feel its safer, but it is way more expensive than your other options for what you get. Given how Mulu is super duper safe, only stay here for the convenience. Longhouse Rooms, with air-conditioner and en-suite bathroom, from RM280++ twin share. Rainforest Rooms, with fans and en-suite bathroom, from RM180++ twin share. Dormitory, 21 beds with fan and shared bathroom, RM55 per night. This is the only accommodation you can find in most booking sites. Furthermore, it is the only place besides Park HQ that has internet, and spotty at best. I went for a drink to get some emails done and wasn’t able to connect all night. I will note that this is the only accommodation that I didn’t see for myself, but it seems to be old and is listed on the original Google map. Cafe Mulu – This is within Park HQ right next to check in. The prices are higher than pretty much anywhere, but still very reasonable if you consider you’re in the middle of nowhere. Other guests really disliked the food but I found it to be quite good. Cafe Tenguloh – Conveniently across Mulu Village. The food isn’t bad, but there were better places. The owner was quite nice though and gave me free fruit. At the end of each month, the employees from Park HQ, the Marriott, and the airport get paid, so they throw a party here. Food Stand – The hours were inconsistent unfortunately and they don’t always open the four days they say they are open. However, the food is good. Blue Sky BBQ – Didn’t get a chance to try it. Opens from 5:30PM, which is rather odd since it isn’t exactly a nightlife kinda town. Marriott – Admittedly, I just had a drink, and it was mediocre at best. They charge 3-5x what pretty much every other restaurant charges and at least from the drink, it wasn’t worth it. The hotel is nice though if you just want to relax by the couches. Kind of surreal that such a place even exists in the middle of the jungle. D’Cave Restaurant – Didn’t try the food. However, James, the owner of Mulu Village said it wasn’t as good as Shamrock. Shamrock Guesthouse – Food was fantastic and very reasonable. Bamboo Restaurant – Apparently, this place used to be very popular. However, due to a family dispute, it was temporarily closed while they settle who gets to run the restaurant. Sweet Water Restaurant – The food was okay, but nothing special. The people were very nice though. Seriously though, I went here like 10 times and tried something different every time. EVERYTHING was great and they have a bigger menu than most restaurants in the area. SG Pala – A well stocked mini mart with water, essentials, food, and knick knacks. Mulu View Mini Mart – Another option for essentials and water. Park HQ – Mulu’s official Park HQ also has a mini mart, but it is the smallest of the three. Anyways, I hope this guide is helpful. If you need any explanations or elaboration, feel free to leave a comment.